Welcome to the world of the unique technical diving! If you are on this site, it means that you are a diver looking for more than recreational diving. Perhaps you use a twinset and stages, or you dive with a rebreather? The Empress II is a vessel equipped with all the equipment which minimizes the risks associated with technical diving and increases the comfort of such diving. With sonars and underwater radar you can find each position with the accuracy up to a few square meters. We have a system of underwater bars for decompression at 4.5 and 6 meters under water, and long hoses transporting oxygen to these bars. This form of extra surface support is something unique on the diving boats. Meet amenities for technical diving, the EMPRESS is equipped with. See the route of technical expeditions! 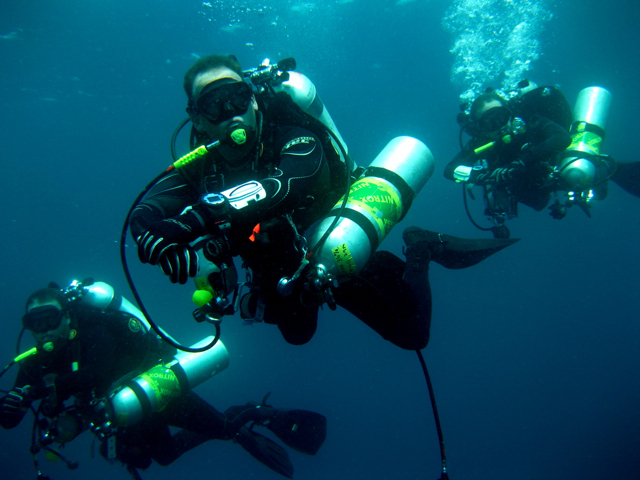 Technical divers are always welcome at our dive safaris. We are prepared for tech diving during our regular recreational trips in Flores-Komodo direction, and during tech safaris as well.